Once conquering the basics of Copic markers, it’s time to dive in and learn how to use different marker application techniques to advance your art skills! In this class students will learn 42 techniques, taught in a systematic way so the ideas build upon each other. The finished product is a piece of Hex Art suitable for framing and displaying in the studio! Prerequisite: Copic Jumpstart Class. 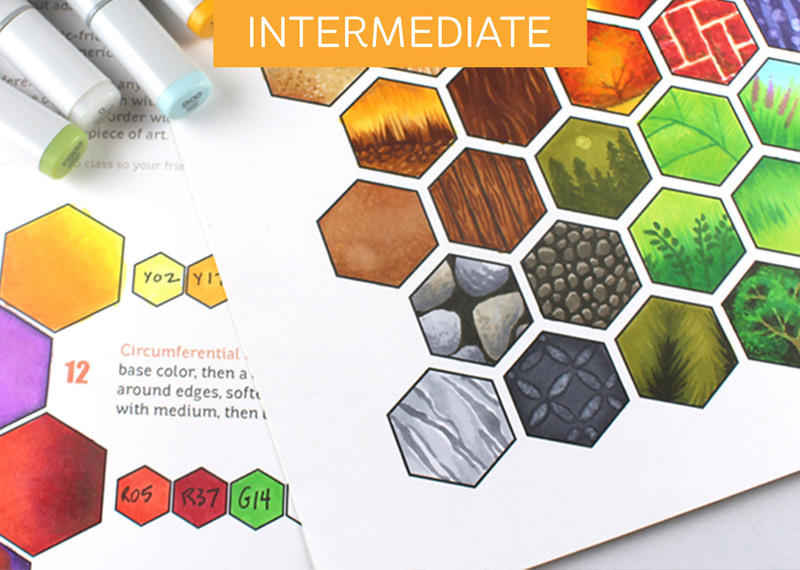 Markers used in that class will be adequate for this Hex Art class, even if not the same colors as the instructor uses. Adaptation by students is encouraged! See supply list for this class in the free preview lesson in the “curriculum” tab. Students will practice a variety of ways to blend with textures, techniques using the colorless blender, and a variety of ways to create natural elements – sky and sea, minerals and plants. The 42 videos (3.5 hours) are broken into six themed lessons which will enhance a deeper understanding of marker strokes, color layering, and light and shadow! Sign up for class today and get immediate access to the lessons – and start making art right away! I enjoyed every lesson in this course. The detailed examples and clear instruction made it easy to follow along. The techniques taught are quite helpful for a card maker like myself. Incorporating these techniques into backgrounds will be even easier with the ability to reference any lesson on demand. I framed my piece and have it proudly displayed in my crafting space; great job Sandy!